How many albums did we release? Including “Live in Osaka” and “Osaka Ramones”, the new album “Adventure” became 20th since “Burning Farm”. Without these 2 albums, it will be 18th. If including the very first cassette album “Minna Tanoshiku Shonen Knife”, it’ll be 21st or 19th. If include best hit albums and overseas release, it’s impossible to count. Anyway, “Adventure” is the coolest album for me so far. The new album has the same concept with the previous album “Overdrive”. The concept was 70’s rock but　I’m sure that the new one got on a high level. When the 10 songs in the album came out, I could concentrate very well. It was recorded by the original member Atsuko who came back from this album, the new drummer Risa and me in December 2015 in Osaka. The bassist Ritsuko who is taking childcare leave and Naru who had been a support bassist joined the recording and played the bass for one song each. We had very good time at the studio. It became a very gorgeous album. The incredibly cool artwork for the album cover was made by Solmania Ohno. Atsuko made the new stage costumes. They are so gorgeous! I think Shonen Knife is very unique, the "one and only" band. I hope you enjoy our new album which is simple, happy, sweet and it has a bit of ironic taste. We made a new album " ADVENTURE !". It's Rock and Fun album!! When I heard demo version of those songs I got chilled! It was fun working out bass lines. I really enjoyed playing with Risa's drum and Naoko's guitar. I felt so great! Ritsuko and Naru played bass and sang backing vocal, too! The album has heavy songs, unique songs, melodious songs and more! I want to play lots of songs from this album on the stage. Please listen to this new album and have fun!! Hello, I'm a drummer Risa. I joined the recording for Adventure as an official member first time. I'm not good at English but I sang in English for one song. Atsuko came back to the band and Ritsuko and Naru joining the recording, Adventure became a very gorgeous album! We got more ROCK and POWEFUL!! Please keep your eyes on Shonen Knife! All of us had been waiting for Atsuko's back!! This new album with the comeback of the original member and the come-in of a new drummer Risa, is an adventure as the album title goes. It ushers us into the adventurous discovery of the new world of sound with the original and new members. Get "Adventure" and let's have an adventure!! I played the bass on "Dog fight" that is the 1st song about a dog. I wonder my face looks like a dog. 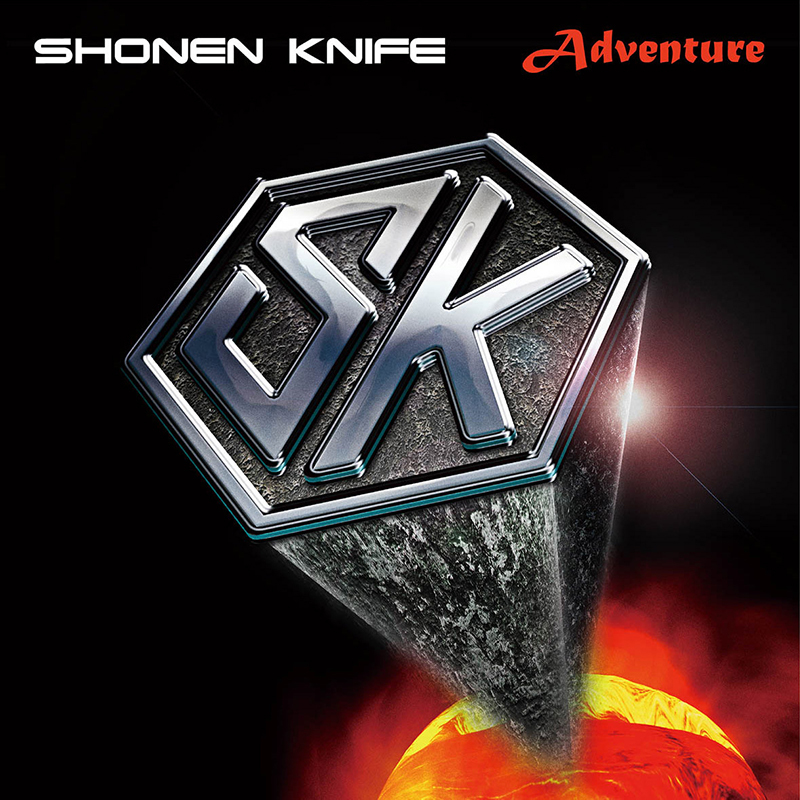 The new album of Shonen Knife 'ADVENTURE' is out! Naoko whom I love, the respectable song writer wrote splendid songs for the new album! I listened to it and realized again how I really love Shonen Knife! Naoko's characteristic unique vocal and guitar phrases explodes. The original member Atsuko's matching backing vocals and the aggressive bass lines are cool. Risa's powerful drumming which grasp the key point of the knife sound well in spite of her first recording for the band. Her voice is cute, too. It's a perfect album because it has one and only rock sound of Shonen Knife, beautiful harmony and humor. Right after listening to this album, I was attracted and realized that 'this is exactly Shonen Knife!'. I have been a fan of the band 20 years. I was encouraged by the lyrics, dancing to cheerful songs, got happy by the beautiful melody lines. Hey everybody! 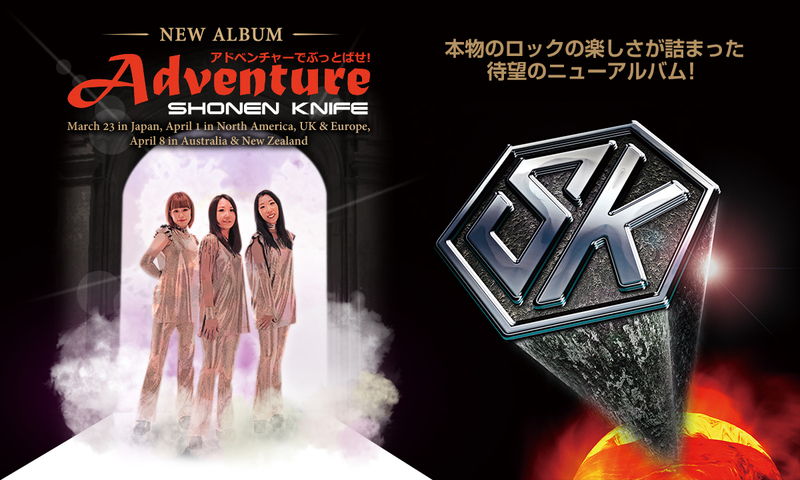 Listen to the Shonen Knife's new album ADVENTURE! And let's have fun! ROCK!! I played the bass for one song as a member of Shonen Knife family for the first time. (M-9) I did my best to play powerful bass and I enjoyed the recording session a lot in a pleasant atmosphere. I'm happy being a fan of Shonen Knife. What a great album! When you jump into the new world, you might get nervous but it goes well with music. This song is like that. Our new drummer Risa moved to Osaka from her hometown Oita. It’s her “Jump into the New World”. I was inspired by the event. The melody became pop. I wrote this song because I love rock T-shirts. It became a groovy song. Calabash is a lucky charm in Japan and a trade mark of a historical Samurai, TOYOTOMI Hideyoshi who was a lord of Osaka Castle. The theme of this song is my hometown Osaka. Osaka is a very ROCK town. ‘70’s hard rock song. When I visited Katsura Hama beach in Kochi prefecture in Japan, I watched dog fight. It’s a little scary but I made gentle melody line on it. I like spice like mustard or wasabi. Wasabi is a Japanese food which is popular to people in western countries used for Sushi. I want people to know it can match with various food. I made exotic melody lines. I got Kabosu tangerines from our new drummer Risa’s mother as a gift from her hometown Oita. I was inspired by them and made this song. Kabosu is a tiny green tangerine and Oita’s local specialty. It can be used like lemon. So tasty. When I write double horn sign with “emoji”, it’ll be “ImI”. Emoji is from Japanese language which means “picture letters”. Japanese emoji is different from English one but it’s fun. I’ve heard that DIO invented double horn sign so I put hard rock style melody line on this lyrics. I haven't been to Hawaii for many years. Recently I’ve heard that my friend went to Hawaii and now I want to go there. I’ve ever been there for sightseeing and having a show. It’s a good place. Shonen Knife was invited a festival in Tasmania island, Australia in January 2015. It was my first visit there. I was so impressed the beautiful scenery of the island and made this song. Tasmanian Devils are living there. It looks cute but very wild. I saw them at a zoo in Brisbane. They were eating raw mouse. I wanted to express such gap with twin lead vocals of Atsuko and I. The motif is cotton candy which is my favorite. I wrote the lyrics first and when I saw it, the rap style melody line appeared spontaneously. I used only three guitar chords for this song but the arrangement became very colorful and a little bit inspired by 70’s Beatles. Why is it so hot? Hot! Rock on! Rock on! Rock on! Rock on! 712 DAY PARTY 2016 "アドベンチャーでぶっとばせ！"
Copyright © Shonen Knife All rights reserved.